At the foot of the Huachuca Mountains, the U.S. Army founded one of the most crucial military posts for American expansion into the southwest frontier. 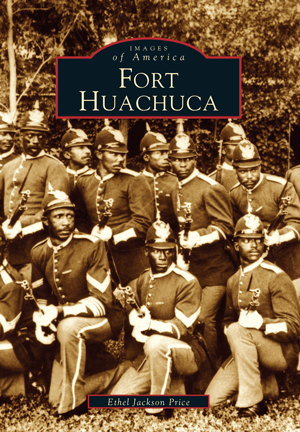 Soldiers had been stationed in the region for decades, but in 1877 Fort Huachuca became the symbolic cornerstone of America's western domain. The Native American word huachuca, meaning "place of thunder," described the sporadic but marvelous electrical storms in the area, but the skies would not be the only thing booming. During the tumultuous campaigns to resolve American and Indian disputes, the U.S. infantry and famed Buffalo Soldiers faced off with Geronimo and his Apache nation in both tense negotiations and bitter combat. As time marched on, the fort developed into a permanent installation with barracks, modern training grounds, and other facilities to accommodate troop rotations and eventually became the innovative Center for Military Intelligence. Local historian and writer Ethel Jackson Price has gathered a fascinating collection of images from both military and museum archives to tell this landmark's singular story. Also the author of community histories of Bisbee and Sierra Vista, Price effectively presents readers with the trials and the accomplishments, the hardships and the pride of the men and women who dedicated themselves to the service of their country and created the unique legacy of Fort Huachuca.